When it comes to practicing for your driving theory test, there is no substitute for testing yourself against the actual questions that will appear in the test. To that end, we have all the official questions for car drivers on site so please do sign up and test yourself against them. Here is a word ladder for you to tackle. Can you move from the word 'BRAKE' to the word 'GEARS' by changing one letter at a time in five steps? This type of puzzle is called a word ladder. If you can't do it in five steps, how about six steps? For a little fun, here's another driving theory game, it's a Driving Theory Wordsearch and contains twenty driving related words for you to find that might be hidden forward or backward, up or down, or diagonally in any direction. The solution is on the second page if you get stuck or want to check your answers. Finally, here's a wordwheel. 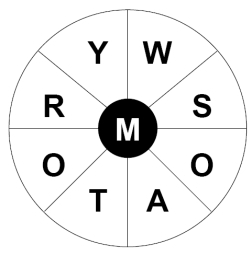 Can you find the driving related nine letter word in the wheel, it uses each of the letters in the wordwheel once? Remember to Sign Up Now and test yourself against the multiple choice driving theory test questions.